Fact: I’m not very good at paper crafts. I remember receiving a paper doll when I was little. She had nice dresses, hats, bags, and even shoes. Super cute. All I had to do was tear the doll and the clothes out of a sheet of board, and I could start playing. It was supposed to be easy, after all it was a kid’s toy. It had those tear-away sides, the ones that are punched with little holes so you can easily pull the pieces apart. I ended up tearing off a few tabs on a few pieces, so some accessories couldn’t be secured properly onto the doll. I think I also ripped one of the bag handles. Scotch tape to the rescue! Years later, my mom tried to get my brother and I interested in origami. While Boyong was making paper cranes in no time, all I ever made was a paper wallet and half a box. Half lang because it took me forever to finish just that. Lol! So, there, paper isn’t really my friend. So truthfully, I wasn’t all that interested in decoupage at the beginning when my partner in Crafternooning, Michelle, first asked if I wanted to try it out. Then I figured I should give it a shot. I did my research and eventually got excited about it. It’s a good thing that I did because I actually made something nice during our intimate session with Ingrid of Heisl Paper Napkin Creations. Would you believe me if I told you that I made this? It’s a decoupage passport holder. Diba so nice??? @Heislnut taught a private class for a few good friends and I yesterday. Super fun. 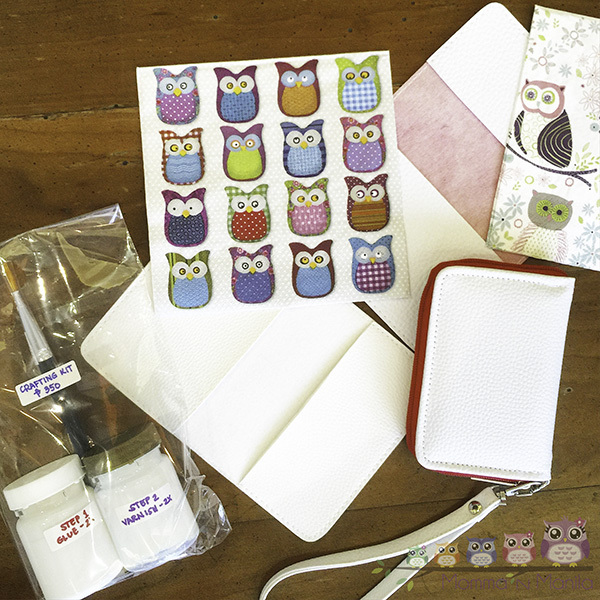 We’re offering decoupage for #crafternoons real soon!!! Who wants to come? Isn’t it so pretty? It’s the perfect going away gift, too, for my sister who is off to NYC in just a few days. I gave this to her a few days after the class, and she loved it! 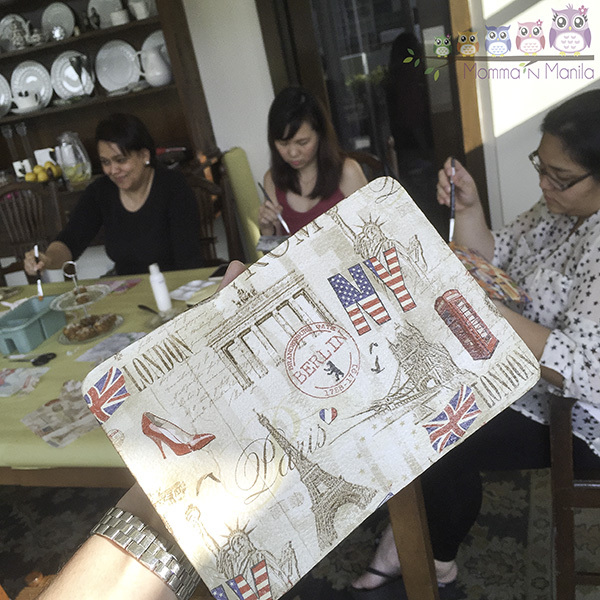 There are three fantastic things I learned about decoupage from my experience that day. First, decoupage is so relaxing. There were several moments during our afternoon session when the room became completely quiet. It was completely serene. I think that the rhythmic brush movements and seeing the project come together under my fingertips was what did it for me. Second, with decoupage, there’s room for mistakes. Thank goodness for that. First step pa lang, I made a mistake already. I cut my napkin wrong! Told you I’m no good with paper. Fortunately, Ingrid showed me how I could still save my napkin, and my project. The finish product will tell you that it was a success. Third, it’s hard not to make something pretty with decoupage. Really. This means that it’s good for the crafting-challenged, like me! The possibilities are endless. I’ve even seen some advanced decoupage projects on Pinterest where people make collages out of the paper that they use. So nice! The nice thing about working with Ingrid is that she has these amazing napkin designs, so you have so much to choose from for your project. It actually took us quite a while to decide on our final napkin designs before getting started. Mish and I enjoyed the class and working with her so much that we’ve decided to put together another class. This time it will be open to anyone who wants to join us. 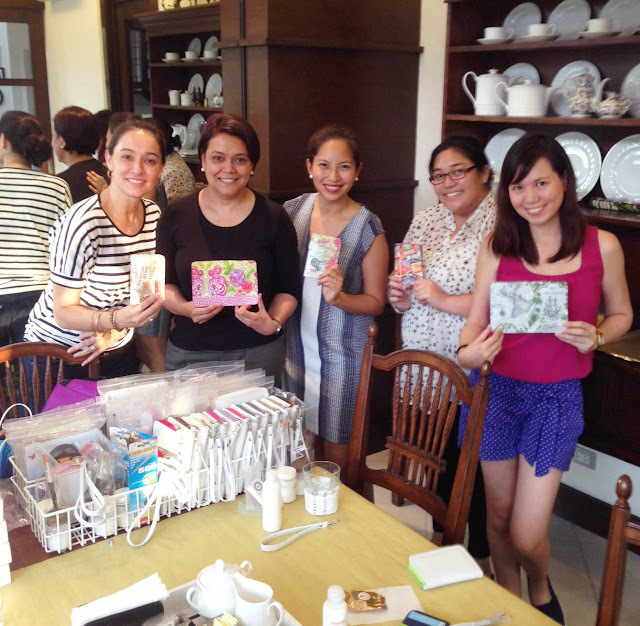 Our next Decoupage Crafternoon with Heisl is scheduled on August 26, 11AM at Draft in Molito, Alabang. Fill out to form below to sign up, and then wait for us to email you the payment instructions so you can secure your slot. Workshop fee is PHP2,000, and includes a workshop kit and lunch. Hope I see you guys there! Oh, and if you would like to stay updated on the different classes we are putting together for Crafternoons, please like us on Facebook and follow on Instagram! Check out the Heisl Facebook and the Heisl Instagram pages, too, while you’re at it! Decoupage! Shucks! Di ko yata ma-pronounce.. LOL! I read about it when you posted it through IG and wondered what that is. I agree! Decoupage really does make things more beautiful than it is. This crafts looks cool! Especially the New York stuff. I will let my mom see this since she loves some craft works. The passport holder look so cool. You are really creative. Looks like a fun workshop! I’m crafting-challenged too but I feel like I’m kinda improving already because of the planner-related crafting that I’ve been doing lately. 🙂 Your passport holder looks nice. I’m sure your crafting skills will get even better in time. Ang ganda ng passport holder mo. I am looking for one also kaya lang I cant find one here. If I do move back to the South, at least I can count on your blog to know what interesting activities there are for mommies like me. 🙂 Ang galing naman ng passport holder mo! I’m not very crafty myself, but I do pretend sometimes, hahaha. I remember wrapping milk cans with tissue and glue a la Art attack and painting on it with poster paint. Those were the days when we didn’t have internet nor cable at home. 🙂 I’m wondering if decoupage is anything like that at all? Wah! I’m so tempted to attend this, Patty! I’ve actually been wanting to attend one of the Crafternoon sessions for so long now. Diyahe lang, I won’t know anyone! 🙁 Do you have a list of your upcoming sessions for the next few months?